When I started working in the queer movement in Boston in the late 1970s, formal LGBT organizations were very rare. Almost all the groups I worked with were not formally incorporated or registered with the government as nonprofits. Gay Community News, Lesbian and Gay Media Advocates, Allston Brighton Green Light Safe-house Project, LUNA, the Feminist Caucus of the Boston Food Coop. We were all volunteer groups, not registered, although organized around goals, values, decision-making processes and theories of governance and accountability. Funders for LGBT Issues noted there were about 50 LGBT organizations in 1969. These groups had to fight to even get formal governmental approval. Lambda Legal Defense and Education Fund’s founders note that when it was formed in 1973, Lambda had to become its own first client. A New York judicial panel rejected Lambda’s application to be a nonprofit organization “because, in their view, our mission was “neither benevolent nor charitable.”” Lambda used pro bono lawyers to appeal to New York’s highest court, which ultimately allowed Lambda Legal to exist as a nonprofit organization. 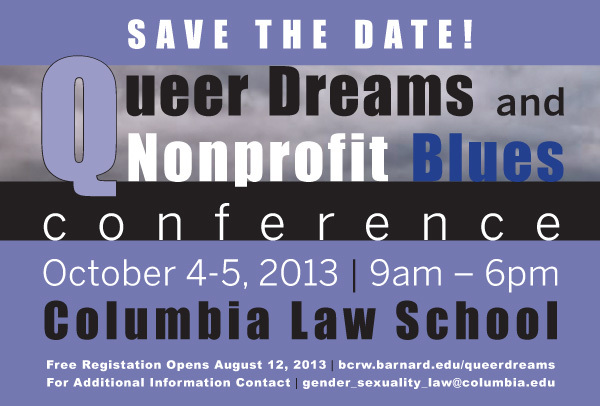 Today, large parts queer work are dominated by the formally organized sector of nonprofit organizations. The forty largest national LGBT organizations comprised $208 million of this total. These organizations employed 925 staff and had 695 Board members. No firm data on the total number of formally constituted LGBT nonprofits, but the Movement Advancement Project (a think tank on the LGBT movement) used the 2011 Guidestar database to identify 502 active LGBT focused nonprofits. These groups spent more than $508 million dollars. The context in which queer nonprofits operate is important for us to consider as we think about how to build our movements. Today’s fight to shut down the federal government has deep roots in US history. On a political level, it’s a fight against federalism and about the role of government in providing social support systems. It bears noting that opposition to an expanded role for government in addressing poverty and providing for the general good have long been fueled by to things: by white resentment at having to address the legacies of slavery and racism, and by the anti-communist, anti-statist ideologues that dominated US domestic and foreign policy for more than 50 years, into the 1990s. The federal government’s role in the provision of supportive services, and its reliance on voluntary associations to do this, expanded first in the aftermath of the US civil war. The period of Reconstruction saw emergence of “new power for national organizations, parties, media and the growth of the voluntary sector,” according to nonprofit sector historian Peter Dobkin Hall. And this expansion was resisted strongly by political leaders from Southern states. Two other expansions of the federal role in addressing social needs emerged after the Depression through the New Deal, and in the 60s through the War on Poverty. Under the New Deal, the federal government implemented social insurance programs like (unemployment insurance, social security, pensions, created a framework for workers rights/labor laws, the first federal income tax (1943). This expansion was vehemently resisted by conservatives and by and industrial leaders who feared the expansion of communism and socialism in the US. When this framework was expanded again in the 1960s and 1970s through the implementation of the war on poverty programs (food stamps, VISTA, EEOC, Head Start), it was resisted again by those who argued that a social safety net would create a dependency that would undermine people’s willingness to work and thus undermine free enterprise. As the government commitments and regulation grew and required higher taxes and deficit spending, anti-tax, anti-government, libertarian and conservative movements began to organize more actively. Their intellectual leaders – like Lewis Powell, William Simon and the Heritage Foundation articulated a political and economic ideology (small government, less regulation, a big defense sector, and unfettered expansion for corporations). Their strategists forged alliances across previously isolated corners of the right and connected economic conservatives with religious or cultural conservatives, who were worried about the impact of new social movements that were changing the power women had in society, by the demand for racial equity and redistribution, and by gay rights. Ronald Reagan’s presidency gave power to the reactionaries for the first time. And his mission was to dismantle the welfare state as it had come to be known in the 60s and 70s and install the neoliberal state — built upon deregulation, free trade, less taxation for corporations, privatization, devolution of services, and aggressive use of monetary and trade policy to expand the reach of markets, and aided by technological shifts, the economic basis of the US economy moved away from the production of goods to the production of technology and the outsourcing of services. Clinton and Bush II continued the work that Reagan began — cutting government programs and welfare, privatizing government programs through contracting and outsourcing, and expanding criminalization and surveillance, and increasing the military and police powers of the state. The Tea Party, a movement hatched in the corporate suites of the Koch Brother funded think tanks and strategy firms, must be seen as just the latest manifestation of a carefully executed strategy for social dominance mapped out by right wing funders and activists, achieved through the systematic construction of a policy, legal, political, intellectual, grassroots, media and philanthropic infrastructure that is aimed at keeping social control for its owners. The results have been phenomenal – conservatives helped elect Presidents in 1980, 1984, 1988 and 2000, won conservative majorities in the Senate (in 1994, 2002, 2004, 2006, 2008, 2012 in the House), and won major gains in Gubernatorial, state legislative and mayoral elections. Amidst all this change – the nonprofit sector has grown dramatically – serving, as Miranda Joseph called it, as a metonym, a substituted concept, for the idea of community, at the very instant that such community was being destroyed by neoliberal economic policies. Peter Dobkin Hall notes that more than 90% of current nonprofits were formed after 1950, and most global NGOs are about 35 years old. As government funding for poverty alleviation, housing, social services, health and other social systems grew, nonprofits became the implementers and the means through which many programs were carried out. A symbiotic relationship came into being – between nonprofits, government funders, corporate and private philanthropic funders, which began to change in the 80s and 90s with The devolution and privatization of government programs. Today there are over 1.6 million tax exempt organizations registered with the IRS*, as of 2012. Over 1 million of these are 501c3 public charities and another 97,382 are 501c4 advocacy organizations and 327,000 are religious congregations. In 2011, more than 270,000 organizations lost their tax exempt status, and over 50% were human service or public benefit groups. Most of these nonprofits are small. Of the 1 Million 501c3 organizations filing Form 990 in 2010, ¾ reported revenues under $500,000. Nonprofits with budgets over $10M totaled 4% of all public charities but accounted for 85% of all spending. Nonprofits are heavily funded by government – receiving almost a third of their income from government and two thirds from private sources. Nonprofits enjoy extensive support, with 27% of the US population estimated to have volunteered for a NP in 2011 ($64.3M) (And more than 63%of all households donated to a nonprofit. Neoliberal policies have had a paradoxical effect: they reduced the funding available for social services, but they increased demand for services through increased unemployment, dislocation, inequality, poverty and the abandonment of people who had previously been supported by a social safety net (like the mentally ill). For me the key issue facing all movements working under neoliberalism is how we are going to overturn these policies – it is a political question. 1) The first challenge is that government at every level has less money and is often running at a deficit. At the very instant the movement seeks to support the lives of queer seniors, queer youth, our homeless, to de-incarcerate people, to decriminalize, to invest in workforce and employment – there is less money to go around. We came to the funding scene very late as a community – no one but each other supported us until the 80s, when we started to see government funds for HIV/AIDS related organizations. Today, funding for LGBT organizations – from both private and public sources remains very small. For example: The Foundation Center estimates there are 81,777 private foundations, which gave away more than $49 billion dollars in 2011. That same year, only 383 of those foundations gave funds to LGBT groups, a total of $123M, which comprises .26% of all foundation giving. The top 10 foundations gave more than 62% of this total. A survey of 79 of the 200 LGBT community Centers reported that 46% of their revenues of $106.3 million dollars came from government sources, and only 9% from foundations. These centers served an average of 33,000 people per week or 1.7 million per year. And 41% of Center’s reported having 1-5 staff, 18% had no paid staff at all. 4) Finally the challenge we face is that the infrastructure that we have operates in undemocratic and troubling ways. 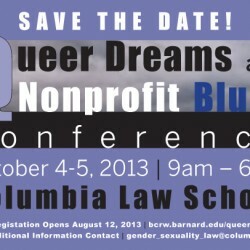 Queer nonprofits are in an especially peculiar position in this because our infrastructures are so new, they have often turned to the professional expertise and experience of nonprofit sector consultants who do not have a social justice vision. Indeed, the overwhelming majority of LGBT nonprofits do not have a social justice mission – a mission that includes seeking economic justice or racial justice or even women’s rights or gender justice – much less do they have an economic analysis that might lead us to engage to fight the Tea Party mindset. How can we ensure that queer nonprofits act more queerly – that they operate less like conventional corporations rather than as transformation oriented institutions; that they operate internally and externally in values grounded in equity or social justice; that they develop methods to increase participation, internal democracy, and greater accountability to the people the institutions purport to serve; that they pay attention to issues of workplace equity, fair pay for all, work-life balance? How can we fund gay and lesbian philanthropy to fund systemic transformation, and not just piecemeal policy change to achieve nondiscrimination and equal access. What political vehicle must we develop to enable us to organize around economic policy and against the power of corporate interests? Is it the current party structure of two compromised parties, or do we actually need a fundamentally new political party? What mechanisms and structures can we create to continue to transform the nonprofit institutions within which we work, study, get health care, so they are more than tools of the existing power structure? Funders for LGBT Issues, 40 Years of LGBTQ Philanthropy, 1970-2010, at http://www.lgbtfunders.org/files/40years_lgbtqphilanthrophy.pdf, p. 6. MAP, 2012 National LGBT Movement report, http://www.lgbtmap.org/file/2012-national-lgbt-movement-report.pdf, p. 4. Peter Dobkin Hall, Chapter 1, Historical Perspectives on Nonprofit Organziations, at http://www.hks.harvard.edu/fs/phall/Herman-CH1.pdf. Independent Sector, Scope of the Nonprofit Sector at http://www.independentsector.org/scope_of_the_sector. Independent Sector, Scope of the Nonprofit Sector, at http://www.independentsector.org/scope_of_the_sector. NCCS Urban Institute Quick Facts About Nonprofits at http://nccs.urban.org/statistics/quickfacts.cfm. Foundation Center, Key Facts on US Foundations, at http://foundationcenter.org/gainknowledge/research/keyfacts2013/foundation-focus.html. Funders for LGBT Issues, LGBT and Queer Grantmaking Foundations 2011, at http://www.lgbtfunders.org/files/2011LGBTQGrantmakingReport.pdf, p. 2. MAP, 2012 LGBT Community Center Report, http://www.lgbtmap.org/file/2012-lgbt-community-center-survey-report.pdf, p. 1. William Ryan, The New Nonprofit Landscape, Harvard Business Review, January-February 1999, p. 129.